This tax season, spend less time printing documents and more time focusing on your clients’ needs. You can print all tax forms in either language at the click of a button. You can print reports on the results of an EFILE transmission as a PDF file, making it easy to store and easily share the report with your client. The Client Explorer’s report function allows preparers to print data from ProFile returns. ProFile’s Client Explorer provides preparers with a simple and convenient method for printing mailing labels. It is easy to print pre-configured print sets for multiple clients at the same time. 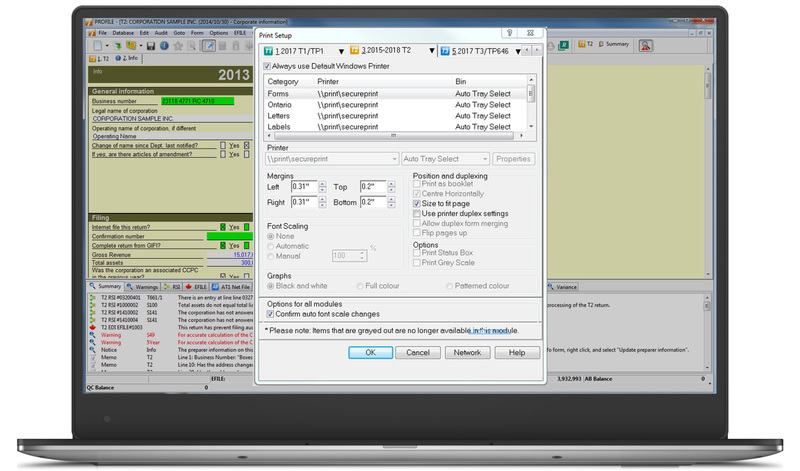 ProFile automatically selects the forms to print for each file based on the print job and print setting options configured in the “form selection” window. For example, ProFile detects that each client selected will receive an “overdue invoice” letter. Carry forward of batch files is an option available in ProFile that easily brings previous year’s returns forward into the current module. It is simple to print the same form for multiple clients at once in a batch. For example, a ProFile user may want to print a form for each client so that it can be mailed for the client’s signature. Note: when printing forms from multiple clients at the same time, you can print only forms from files of the same module and year. Click here for additional tips and tricks to help you become a more efficient ProFile user.